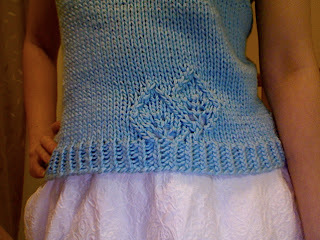 Notes: I have been wanting to do this top since the first time I saw it in the Loop-d-loop book. I really loved it! 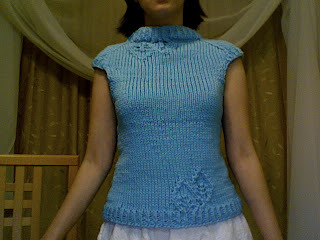 But it's getting to be warm and I thought this would make a great spring top. When I saw that Olgajazzy had some Touche in a fabulous springy color up for grabs on her blog, I jumped at it. I had never used yarn with Modal in it before, but I discovered it to be super soft and comfortable. When held double-stranded, it gave me the gauge I wanted (which was smaller than the gauge in the pattern) on size 10-1/2 needles. According to the directions, you are supposed to knit the bottom half first, then the top, and then graft them together. I decided to do the top half first so that I could make sure it fit properly. The main modification was to change this from a long-sleeve top. I tried doing regular raglan increases, but the points separating the front and back pieces from the "sides" were not the right proportions to do so directly, and moving the points caused disruption of the lace leaf placement. So I ended up doing increases for the front and back every other row, as per the pattern, but then increases for the sides every fourth row. 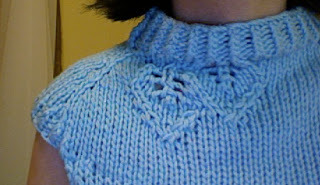 I did lifted bar increases instead of yarn-overs because I don't like to wear tops that have holes along the increases. 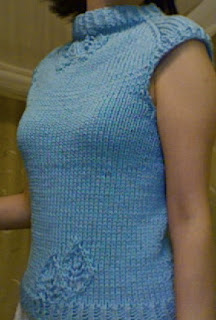 When the sides got to the length I wanted, I did several rows of twisted rib to match the collar, which gave me itty bitty cap sleeves before binding off the sides. The other modification was making it more fitted, with waist shaping, just because boxy things don't look so good on me. I kept the stitches on both the top and bottom live before grafting, instead of binding one set off as per the instructions. The grafting was challenging, and I think it still looks obvious even after I fooled around with it for awhile. However, it's definitely still wearable, and I'm also hoping that it will improve after washing. One final thing--the collar is loose enough that you can probably get the garment over your head without having the button on the collar that the design calls for. I tried various buttons--and maybe I just haven't found the right one--but I thought seeing the single button there was very distracting. So I ended up sewing my button to the inside of the collar. 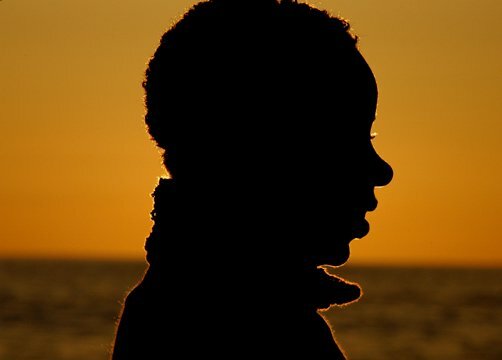 Vy, this is so pretty! And I still love the color! You did a great job and I am sure you will get plenty wear out of this gorgeous sweater! I planned Rebecca Apricot Jacket with it, but even up to this day I have too many other commitments and my own stash suffers from negligence. Wow!! Such a great idea. I love it. I have been meaning to make this sweater for some time. Maybe it will be sans sleeves like yours. Great job! love the color! This is fantastic! I love your modifications. This makes me want to revisit my loop d loop book. Wow, you have all sorts of great ideas! Very nice.